The Samsung Galaxy S4 is the latest sensation in the world of smartphones which, apart from housing awesome specs and a great bunch of new features, also comes with the new improved TouchWiz UXand more beautiful AccuWeather clock widget. If you visit our blog regularly, you must be remembering we posted the ported versions of the Galaxy S4 weather widget for some Galaxy devices like the S2, S3, Note, Note 2, Galaxy Grand, Advance, etc. It has just passed a couple of weeks since the Galaxy S4 system dump was leaked on the net and our developers are already busy with portingthe goodies from the S4 to other Android devices. The latest development has popped up in the form of the successful port of the Galaxy S4Launcher and AccuWeather widget to all Android phones with a Jelly Bean custom ROM. The developer has tested the launcher and widget on most non-TouchWiz ROMs like CyanogenMod 10 and 10.1, AOKP, MIUI JB, ParanoidAndroid 3+ and others. Since the ports are available as flashable zips, it’s needless to repeat it must be installed using a custom recovery like CWM or TWRP. It’s really a great achievement on the part of Linq’z QIrls’z Chinese, the guy who made this possible, because I have never seen TW launcher and weather widget running on a non-Samsung device. I was very curious to test it so I flashed it over CM 10.1 and it just worked fine. If your phone is on a custom ROM, it must be rooted and have a custom recovery installed. So what are you waiting for? Just grab the files from below and enjoy theGalaxy S4 launcher and AccuWeather widget. Download the launcher file according to your phone’s screen resolution and the weather widget zip package. Do not extract them and copy to your phone’s SD card. Turn on USB Debugging mode on device, boot it into ClockworkMod recovery mode and install the zip packages as described below. Please note that the weather widget will only run with TW launcher so you cannot install the widget alone. Do not forget to backup your current ROM using “backup and restore” option in CWM. Now scroll to “install zip from sdcard> choose zip from sdcard“, navigate to the launcher file and select it. It will be installed in a few seconds and when it is flashed, install the weather widget file the same way as in Step 3. When both files are installed, go to “advanced” and “wipe dalvik cache” again. Finally, go back to main menu and reboot the phone. When the phone boots, press/tap the Home button on your phone to launch the S4′s TouchWiz launcher. In case the launcher and weather widget apps do not show up, navigate to the System/app folder with a root file manager app, find the AccuWeather.apk and SecLauncher.apk, and fix the permissions by settings it as follows:Owner= read-write, Group= read, and Others= read. Thus it should be like rw-r-r. When it is set, reboot the phone and it should work. Cheers! 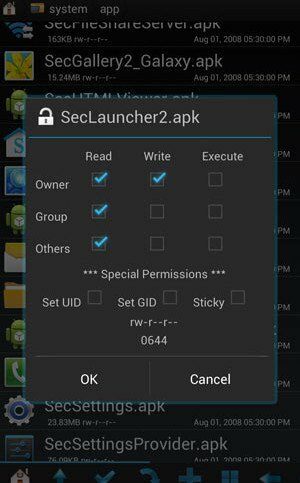 can you make it for ICS ROM ?? Does it work on Samsung galaxy ace s5830i (Custom rom)? the launcher or weather widget? DO you have a s5830 version or s5830i? Oh really..?? :) Thank you sooo much.. Im also in XDA..
Hai Dhairya Gandhi, Isn't work on Galaxy ace s5830i? No news from you...? where i can get galaxy music player ? Can someone post the files again? Give as a 404 page not found. i flashed it on my cm11.. it working but not able to put widgets.. help me.. Awesome work.. Was missing my Samsung on the new micromax. Now I get the old feel, with the launcher. Is there a Samsung dialler & s-planner available anywhere. ?